What colours come to mind when you think of football? If you’re like me, the two that most often come to mind are green (the grass) and brown (the mud inevitably left on your old Jay Fiedler jersey after a pick up game). And those colours took the spotlight in the NFL’s Week 6. 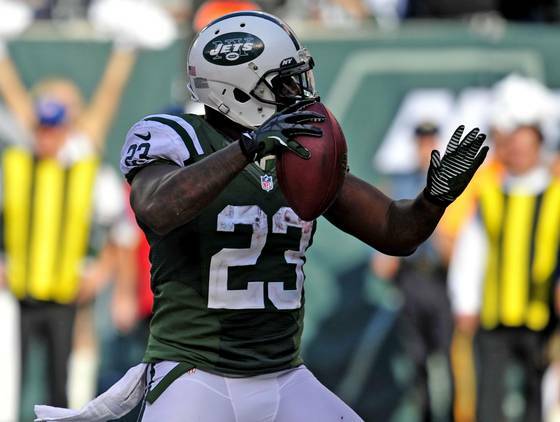 Shonn Greene was having a terrible season for the Jets before Sunday. His team was struggling, and he was averaging around 2 yards per carry (the league average is around 4). On Sunday, against a usually respectable Indianapolis Colts run defense, Greene broke loose for 161 yards and three touchdowns. (Naturally, he occupied a seat on my fantasy bench this week.) The Jets (green uniforms) won 35-6 on the strength of Greene’s performance, and the “WE WANT TEBOW” chants were quieted… for now. Cincinnati Bengals wide receiver A.J. Green also put in his best performance of the season. He caught 135 yards and two touchdowns against state rival the Cleveland Browns, but the Browns came out on top to record their first victory of the year (the last team to do so). 29-year-old rookie Brandon Weeden had his best game, but I need to stop for a moment and praise the Browns’ long-time kicker, Phil Dawson. Dawson has been with this team since 1999 (!) and has been one of the league’s best in that time. He is a perfect 12 of 12 on field goals this year. Seriously, I remember playing Madden 2000 on my Nintendo 64 and Phil Dawson being one of the best kickers to have even back then. I was in grade 8! I now teach students who were not even alive when Dawson first put on a Browns’ jersey. That is a long time to spend with a terrible franchise, and if the City of Cleveland does not make him mayor when he retires, they are doing him a disservice (assuming he wants that job). Best of all, Dawson lives in Austin, Texas, one of America’s coolest cities, in the offseason. 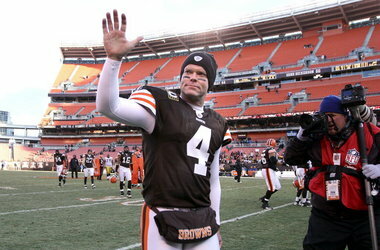 A Same Page Team salute to you, Phil Dawson, whose loyalty is without question. (More on kickers later). Dawson for Mayor? What does Cleveland have to lose? So, how was your weekend, Aaron Rodgers? What’s that now? 6 TDs, you say? In one game? Against the Texans, a job well done, sir. Yes, as that little skit demonstrates, Aaron Rodgers and the Green Bay Packers absolutely dismantled the Houston Texans on Sunday Night, 42-24. This game held a great deal of importance, as the Packers were struggling under the weight of being an early-season Super Bowl favourite, and the Texans were a swaggering 5-0. This game was like when some new kid arrives in the school yard, and starts taking charge, while the school’s alpha male sits back and watches. Finally, forced by fate to meet, the alpha male proves to the new kid who really is in charge. I fully expect the Packers to pick their game up significantly after this week, and get on a roll through the middle third of the season. The Texans, meanwhile, will bounce back from this and continue their strong play to an easy division win, and perhaps even a first round playoff bye. To prove that my whole colours theory is nonsense, the Detroit Lions pulled through an overtime victory against the Philadelphia Eagles. This came as a bit of a surprise, as these teams were trending in opposite directions before this game. The Eagles were playing solidly on both sides of the ball, while the Lions were struggling on offense and defense. Nevertheless, the Lions were able to score 17 fourth quarter points, and the only three points of overtime, to move to 2-3 on the year and prove that they’re not quite dead just yet. Aw, look how excited Feely was. Poor guy. 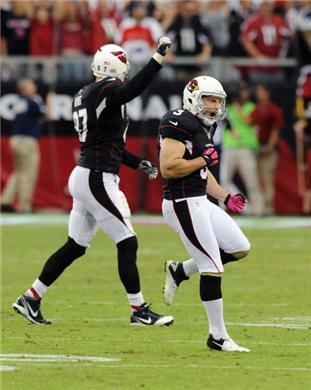 Jay Feely must be scratching his head this morning. The Cardinals’ kicker put his foot through a 61-yard field goal on Sunday to tie the game, but then missed from 38 yards to win against the Bills. That’s a little like Felix Baumgartner nailing the free fall from space, but missing the last step as he comes downstairs for breakfast. Perhaps more than any other, the kicker is a mental position, where mind strength matters as much as, if not more than, leg strength. Of course Feely is capable of hitting a football with his foot over a distance of 40 yards. But what Feely needed was the calmness and confidence of true mental strength. It happens all the time to players all over the field, but it is most noticeable in the kickers. Those Cardinals remain a question mark, as they have now lost two in a row and may be without starting quarterback Kevin Kolb for a while. An interesting note about the Bills: in their previous two games, they had given up 1200 yards and 97 points. For the average defensive team, that’s the equivalent of about 4 games. Yet they were somehow able to march into Glendale and plant their flag for an impressive road victory. The AFC East is again in a dead heat, with four teams standing at 3-3. It’s anyone’s guess how this one will turn out. The Baltimore Ravens beat the Dallas Cowboys, but it was the very definition of a pyrrhic victory. Two defensive stalwarts went to the medical room. Cornerback Lardarius Webb injured his knee, and Ray Lewis injured his arm during the game, and both will likely miss the rest of the season. That raises the question: will Baltimore be the defensive force they have been for a decade, without Lewis? Ed Reed can assume a leadership role, but he is more like the brains of the operation, while Ray Lewis was the “heart and soul”. Ray Lewis still wishes to assure us that his name is his name. Week 6 wrapped up with the San Diego Chargers against the Denver Broncos on Monday Night. San Diego raced out to a 24-0 lead at halftime, on the strength of Philip Rivers’ solid play, and a brutal Peyton Manning interception that was returned for a touchdown. To be fair, the interception appeared to be the the receiver’s fault, not to mention Eric Decker pulling a Jack Cust with the end zone in sight a few plays prior. I guess I’ll just go to bed now, confident that nothing will alter the outcome of this game. What’s that, you say? 35 straight points?! Yes, Peyton Manning once again orchestrated not only a touchdown drive, but a touchdown onslaught in the second half that caught the Chargers absolutely unprepared. Philip Rivers, so solidly Dr. Jekyll in the first half, turned into his Mr. Hyde self with a second half (and especially fourth quarter) that reminded me of a young Ryan Leaf. I’ve said it before, and I’ll say it again: there is a big difference in good quarterbacks and great ones, and it’s not in their physical attributes. Mentally, Manning stepped it up just as Rivers stepped it down, and once the Broncos got hot, the outcome was never really in doubt. That wraps up week 6 in the NFL. Next week, I’ll be interviewing Ryan Leaf. This should be fun, right? Tags: Aaron Rodgers, Felix Baumgartner, Jay Feely, kickers, nested Wire jokes, pyrrhic victory, Ray Lewis, Shonn Greene, Tebow!